The Riedel Vinum Cabernet / Merlot / Bordeaux wine glass is ideal for full-bodied, complex red wines that are high in alcohol and tannins. The generous size allows the wine to aerate in the glass and the bouquet to develop fully. The shape of the rim directs the flow of the wine to the front palate to enhance sweetness, thus accentuating the fruit while softening bitter tannins. Why are the newer glasses lighter in weight than the older ones? BEST ANSWER: I have heard of no change from Riedel on the vinum cabernet glasses changing weight or size. They should be the same if you are comparing the same glass. I am not sure but We sure like them better as they seem more fitting to enjoying fine wine. Have both and no - they weigh the same - as I observe anyway. Is the Reidel Vinum Classic the same as the Riedel Vinum Celebration set? BEST ANSWER: Riedel Vinum Cabernet/Merlot/Bordeaux Wine Glasses (Set of 2) and the Riedel Vinum 260 Years Celebration Set Cabernet/Merlot are the same glass. Riedel wanted to celebrate their 260 year anniversary with every wine lover by offering special limited edition glassware sets. Thank you, Sarah. I just ordered the Celebration set! So very glad to hear you've ordered the Reidel Celebration glasses. Enjoy them. Cheers. What are the box dimensions for the set of 2 glasses? What is the dimension of the circumference? BEST ANSWER: Thank you for your inquiry. The circumference is approximately 12" If you have any further questions, please feel free to contact us at 800 356 8466. Thank you again. These are very nice glasses. They are clearly not high end glasses in that the delicacy and size isn't top drawer. But they are also half the price of the sommelier set. I'd recommend them for people wanting to step up from base level wine glasses but unwilling to drop $90/glass. Everyone should have a set of these in their cabinet. Useful for any occasion and most reds. Great style that will stand the test of time. Classic yet stylish. These are the best everyday red wine glasses for me! 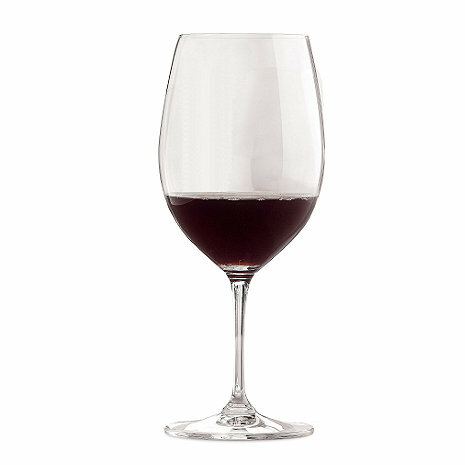 Riedel has elegance and superior quality associated with its name. That is true. However, at Wine Enthusiast you can afford Riedel wine glasses. We use them as our everyday glasses. It is impossible to beat this quality at this price. Riedel truly makes your wine taste better. They were a gift for knowledgible wine drinkers and were well received. Makes a $5 wine taste like a $15 wine. I love these glasses so much, because they really do improve the experience of enjoying a wine! They are a good value, but they are finely made and have to be washed by hand. I wish they were cheaper, but I wish wines weren't getting so expensive, either. Really do make a difference! We use our glasses daily, and they really do improve the taste of the wine. I like these so much I plan to add other varieties to my collection and give them as gifts as well. As the manufacuter states the glass does make the wine taste its best. By their make and feel the glasses also increase the pleasure of the wine drinking experience. I don't consider the glasses to delicate but some people might; they aren't a mug. These are really nice glasses. They feel great in your hand and make your wine taste even better! These glasses, although delicate are beautiful, light weight but balanced and well constructed. I bought them for my boyfriend for Christmas and he loves them. Yes, I am concerned I will break them, but you just have to be a little more careful. I'm not sure if they make the wine taste better, but you almost feel decadent using them. Great way to buy these wine glasses. Good price, and I didn't need to head to the mall to shop for them! I enjoy the varied shapes to fit my wine selection. Love these glasses. Use them for family everytine. You will replace some as they are delicate and may break if not hand washed with care. I love these glasses and have them in several sizes for various wines. Personally I do not put them in the dishwasher as they are delicate and I think the dishwasher is too harsh on this type of glass. They have a great feel in your hand and definitely are the right shape to release the scents of the wines. We have used this product for years and always buy more when we occasionally break one. Really makes a difference in the enjoyment of a wine. Personally, I don't notice a difference from the Speigalau's, but my husband insists they're better. The glasses don't have a long shelf life, at least at my home. I have come to understand the value of a good wine glass and how it compliments the wine. These glasses are simple yet well crafted to allow a wine to open up. I personally don't put good wine glasses in the dishwasher even though these are supposed to be dishwasher safe. The bowl is big enough for me to wash by hand easily. I would definitely recommend these glasses to anyone who really enjoys wine. You will love these glasses! These are great wine glasses to use for any type of affair. They are very nice for having a wine tasting because of their design. Beautiful and useful! A pleasure to use. Great glass, durable to use at any occasion! Wouldn't drink wine from any other glass. Well received gift to my son. Although these wine glasses are expensive they truly do enhance the wine experience. Like all retired folks we are starting to remember to use the good stuff everyday or it will just sit in a childs china cabinet waiting for a special occassion. Exceptional packaging. I have never had a Riedel glass broken in shipment. We have needed to replace broken stems for a while, so when the sale was advertised, the time was right. [...]. Another satifactory experience with your company! I have used these glasses for many years and bought some to fill in for several that had been broken. I love the design, the thinness of the glass as well as the lovely delicate stem, and the way the wine tastes. Excellent - I don't drink wine I care for out of any other glass! I also only hand-wash these glasses. I never believed the glass could make such a huge difference in the wine-drinking experience until I participated in a Riedel workshop. Now I make sure I use the proper glass for the type of wine I am serving. The difference is huge! Riedel makes excellent wine appropriate glasses. If you REALLY want to enjoy your wine, this is the way to drink!! I use these glasses all the time! Love the feel in the hand and they compliment the wines beautifully. I haven't put them in the dishwasher yet...I wash all my wine glasses by hand. I love these glasses, they enhance the experience and I enjoy entertaining with them. I absolutely love these glasses. I drink wine all of the time and heard a good glass really makes a difference. I'm not sure I believed it, but these glasses proved it correct. They are great! Deliveries arrived in good condition at each shipping address. We use Reidel glasses whenever we drink wine at home. The glasses made a huge difference in the taste and bouquet of the wine. I gave them as a gift and my family enjoyed them thoroughly until unfortunately they were broken. I will buy them again, and again. I love these glasses. They are attractive. Only drawback is that they are fragile, so one needs to be careful when washing them and on hard surfaces such as granite countertops and glass tables. I recommend them for everyday use as well as for entertaining. These were purchased as replacements for ones that have broken in the past. Great glasses...just be careful when washing them. They will break.